... A land of peaks and plateaus, mountains and gorges... a countryside crisscrossed by rivers and filled with forests, stone houses, chateaux, vineyards and olive trees. Provence... the art de vivre capital of France. 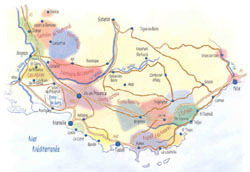 La vie provencale has roots dating back to the Romans. Family traditions are handed down to each generation. The priority of life is about the quality of life... quality of life every day... Provence a place we all long to be.